UPDATE: Go to charlottemagazine.com/CIAA for the list of CIAA parties and events I've compiled. Are you planning or promoting an event during CIAA Week, February 28-March 5, 2011, in Charlotte? If so, click here and fill out the online submission form to be included in Charlotte magazine and Where Charlotte's comprehensive coverage of events, parties, and personalities during the Queen City’s most vibrant week of the year. You'll find content added frequently at www.charlottemagazine.com/CIAA, leading up to the CIAA Tournament. The CIAA Tournament, the annual week-long basketball tournament for the 13 historically black colleges and universities in the Central Intercollegiate Athletic Association (CIAA), has a rich tradition that dates back decades. CIAA officials made a wise choice in moving the tournament to Charlotte, which has hosted it each year since 2006 (and recently had its contract renewed to host the tournament through 2014). The tournament has reached record highs in attendance since coming here. The more than 100,000 people who come to Charlotte each year during the last week in February/first week in March for CIAA will tell you it's about more than basketball (though the men and women's teams put on great games at Time Warner Cable Arena). There are literally close to 200 parties, social, and entertainment events going on that week as promoters and event planners rent out nearly every available venue in uptown and other parts of Charlotte. This "day party" at MEZ last year was one of dozens of parties held during CIAA Week. Photo by Neil Nicholson. The CIAA holds its officially sanctioned events--a three-day Fan Experience at Charlotte Convention Center that's highlighted by concerts and celebrity appearances--but the bulk of the events around town are being put on by individual promoters who want to capitalize on the large crowd of twenty- and thirty-somethings who are visiting and are looking to have a good time. Locals take off work to go to "day parties" on that Thursday and Friday. It's a tradition. 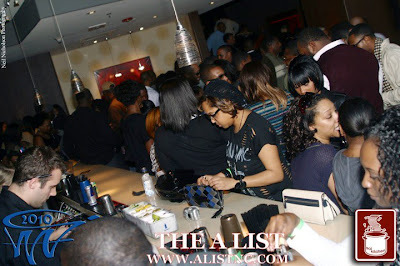 So look for the list of events I'm compiling, coming soon to www.charlottemagazine.com/CIAA. And once posted it'll be updated each week until March 1.